This panel is from Class 6, Eve’s class at the Rudolf Steiner School. 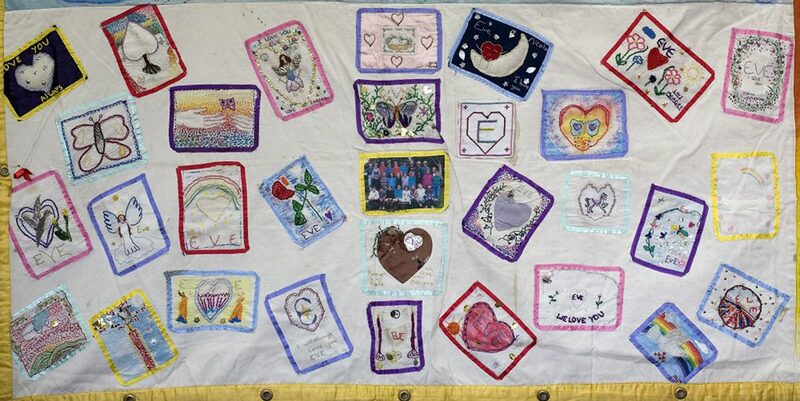 Every Friday afternoon, during the winter of 1994, our Class 6 devoted a lesson to making a quilt panel made up of individual pieces in memory of our beloved Eve. First we designed our own patterns on paper, then we drew the pattern onto the material. People from the school community donated threads and accessories for this project. The photo in the centre was the last class photo taken with Eve during 1993, two months before Eve passed away in November 1993. On my quilt piece I embroidered a butterfly being released by two hands, the butterfly being a symbol of Eve and the hands being the loving people of earth. I chose to do my quilt piece because I thought Eve was a beautiful and loving person. So I chose the heart to represent the love she gave to everyone and the dove was to represent the peace she had in her heart. I put a rainbow and a golden heart on my quilt piece because that’s how I saw Eve. The roses represented the beauty that Eve presented, each colour of the rainbow is for all qualities she has. The rose symbolised the loving heart she had for everyone. the candle represents the glowing heart she had. We all had to make a quilt piece in memory of our beloved Eve. Every Friday afternoon for 14 weeks and a bit of work at home we worked on this project. The theory of my quilt piece was love, strength and life, which I think resembles Eve and her life. The swords on my quilt was a symbol of strength, the tree for life, and the butterfly symbolised Eve and behind it all her love (the heart). The butterfly which I embroidered on my piece represented the butterfly in a verse Eve was once given. When I see a butterfly it reminds me of Eve. In the middle of my piece is a purple heart made from raw silk. Climbing up this is a rose whose petals change from dark purple to a golden yellow which represents her life from the time from the time when she first received the virus to the time she left the earth. The rabbit on my quilt piece represents the time that I took my rabbit to visit Eve, and the hearts, of all the love she gave to us. I chose a pink background because Eve’s favourite colour was pink. My piece was of a butterfly with a heart of rememberance fo our beloved Angel Eve. My design represents the warmth, love and affection Eve had during her life. The heart symbolise her love and the angels her and her angel. I always felt Eve was in the world of fantasy, so I thought a moon with a heart sitting on it and silver stars around it seemed like her. I embroidered a golden heart because Eve had a strong and loving heart. I chose to put a heart on to a navy blue background because I knew Eve loved hearts. I also wrote LOVE YOU ALWAYS. Mine was representing live. The different coloured butterfly on my piece represented Eve being set free from her illness. The border of flowers was sheltering her and the stars meant the sky she would travel. My quilt piece represented half of a life spent well like a sun set. The beads stand for the people that learnt from Eve. On my quilt piece I embroidered a heart with flowers all around it which represented the love and kindness Eve shared with everyone. My quilt piece was of a white dove with a green leaf mouth flying over a rainbow which represents hope, love, and peace. I stitch a heart representing love because Eve was full of so much love. My quilt piece was of my heart showing the light of Eve in it. An angel called Eve, our beloved friend, spread her wings to fly, her love to us all, radiated bright, forming a heart around. I embroidered a butterfly to remember Eve’s verse in morning circle. My quilt piece represents the things that she gave to people, like love, knowledge, strength etc. The little white circus pony represented Eve’s little white pony she loved dearly. The heart around the outside represented the great love she gave out to everyone.